You may be surprised just how many strands can fit into our 1.2mm 7×7 stainless steel wire rope, but the results of our modern manufacturing processes ensure that you get the best of both worlds in terms of flexibility and strength. With this 1.2mm wire rope you get a safe load capacity of 89kg and a breaking force of 0.88kN. Because it is so slender, it can easily be manipulated and used in various scenarios. It may not be the best option for material handling, but for constructing guard rails or acting as a control cable, its dinky diameter is an advantage. All of our stainless steel wire rope products are made using high quality material that complies with AISI standards. This affords each rope excellent resistance to corrosion, keeping the surface clear of rust. Stainless steel is not a hassle to maintain, nor is it as plain and dull as other types of wire rope. Because of this, it is easy on the eye and is a favourite in the construction industry, as well as amongst maritime operators. Along with our fibre rope, you will find few products which are better suited to boating and other marine pursuits. You can buy 1.2mm 7×7 construction stainless steel wire rope from our site in whatever length suits your needs. To get a quote or find out more info, just call 01384 78004 and speak with our team. Alternatively you can contact Rope Services Direct via our email form. 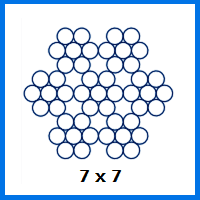 1.2mm 7x7 Stainless Steel Wire Rope Overall rating: 5 out of 5 based on 6 reviews.